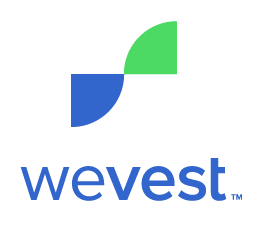 WeVest imagined a tool that could put the computing, predictive and organizational power of a financial planner into the hands of any consumer. Nothing online offers a comprehensive financial forecast complete with recommendations tailored to each user. Current tools provide focused advice and insight into select areas — debt management, investing, retirement and saving — but stop short rather than filling in the whole picture. 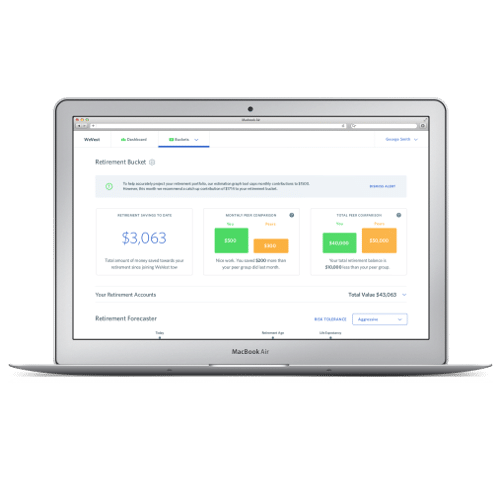 WeVest provides individualized guidance around pre-identified savings goals or obligations including retirement, education, investments, homeownership and debt management. 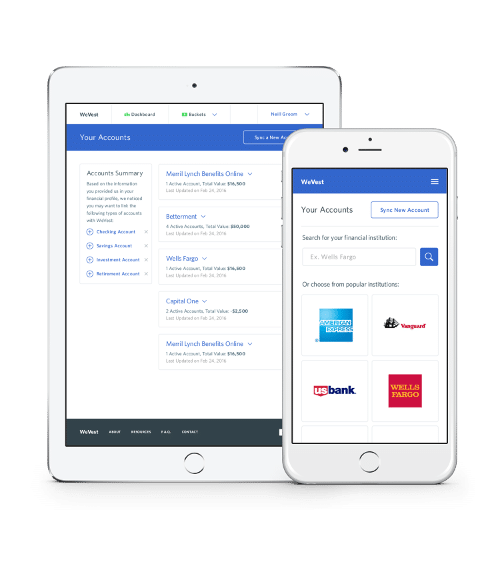 We partnered with WeVest to build a responsive web app that simplifies a consumer’s infinite financial decisions and provides visibility years into the future. For individuals and families, some of the toughest decisions center around allocating discretionary spending versus savings. 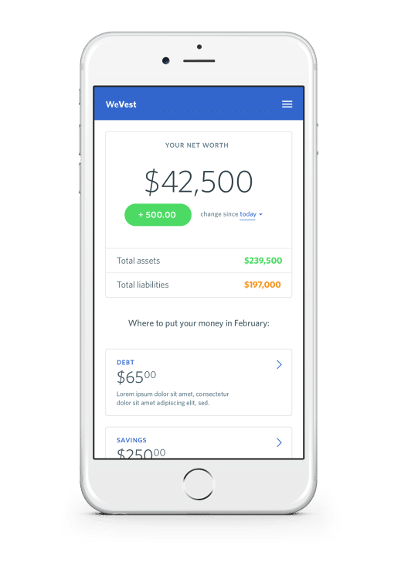 After creating a financial profile and entering existing liabilities, savings goals and assets, the app identifies the amount users must contribute each month to meet current obligations, known as the WeVest percentage. Users are then given the option to increase their WeVest percentage to build net worth and work toward automatically-generated targets. 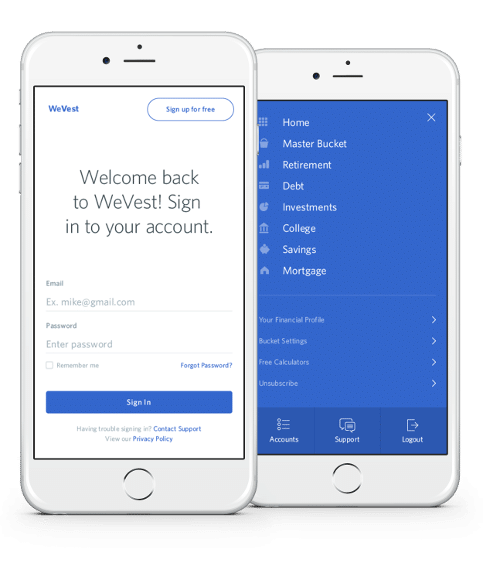 The proprietary algorithms we created with WeVest drive all financial recommendations and net worth forecasts in the app. The algorithms adapt to each user’s situation and mature over time. WeVest helps users new to personal finance to build a savings safety net and reduce debt. As they advance, recommendations will focus on short- and long-term goals. Through the graphical dashboard, users can view all debt, assets and future savings forecasts. Based on recommendations, money is moved/invested outside the app. Daily check-ins allowed us to maintain velocity sprinting toward a beta launch. Modernizing finance and maintaining a sense of minimalism were key to our UX approach. We created a fresh aesthetic that challenged traditional design trends and appealed to younger users while mobilizing color, shadow and context to visually lead action within the app. Two visits to our technical center in Bulgaria refined the algorithms and enabled the product and development teams to directly collaborate. 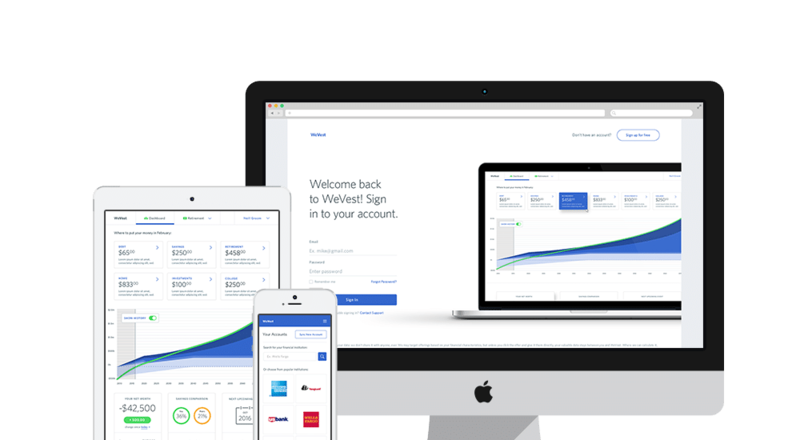 WeVest allows users to integrate data from all financial institutions and asset management solutions into one graphical dashboard — from Wells Fargo to Charles Schwab, Betterment to Simple. Beyond increased visibility, it offers immense savings to users who would have otherwise sought advice from a financial planner. Users with $100,000 can save over $1,000 annually using WeVest instead.